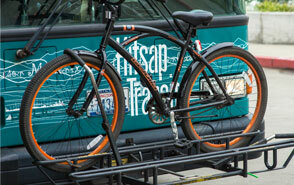 Kitsap Transit’s Smart Commuter Option Of Today (SCOOT) is a car sharing program for commuters who travel by foot, bike, bus, carpool or vanpool to work in certain areas of Kitsap County. If you work in downtown Bremerton, near the Kitsap County Courthouse or near Bainbridge Island City Hall, SCOOT may be the perfect alternative to using a personal vehicle for errands, lunch, appointments or whatever you need to do while at work. Join online and receive your key card once you complete a brief SCOOT orientation. Reserve a car for personal errands via the web or phone. Pick up your car at a convenient location. Return the car once you are finished (your trip info will be sent to us automatically).